Gross Area: 143,400 sq. ft. They dealt quite well spatially with an existing facility to enliven the space. This is an innovative project. I loved it. 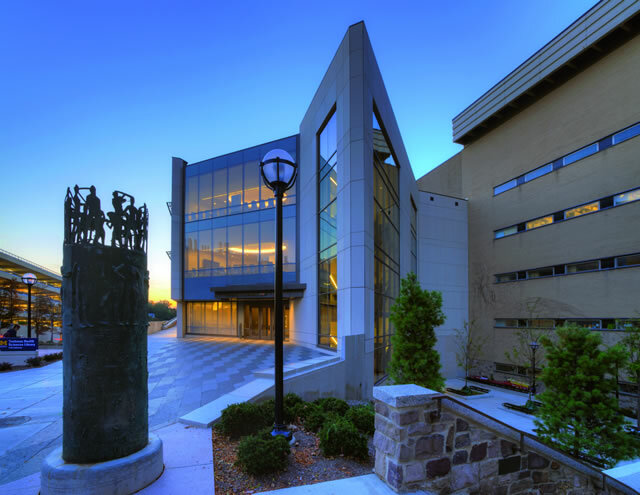 The Taubman Health Sciences Library is a 5-story building that was opened originally in 1980. 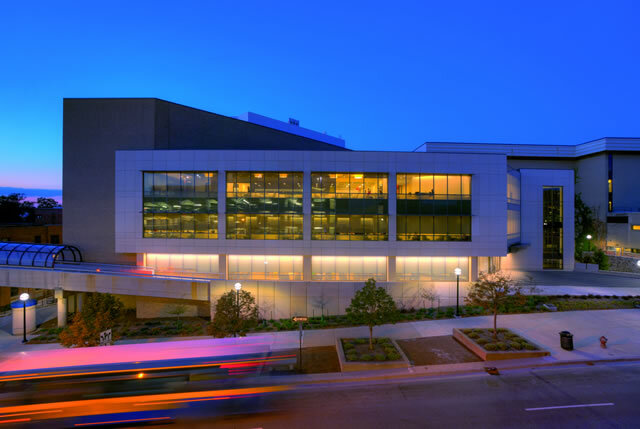 It is attached to the vast medical complex of buildings that are located on the hilly terrain of the Medical Campus at the University of Michigan. The building is a mixed-use building, originally housing the Health Sciences Library on three of its five floors. It also housed a Clinical Skills facility, a Learning Resource Center, two lecture halls and office space. The lecture halls and office area on the lowest floor remained intact and were not renovated as part of the project. 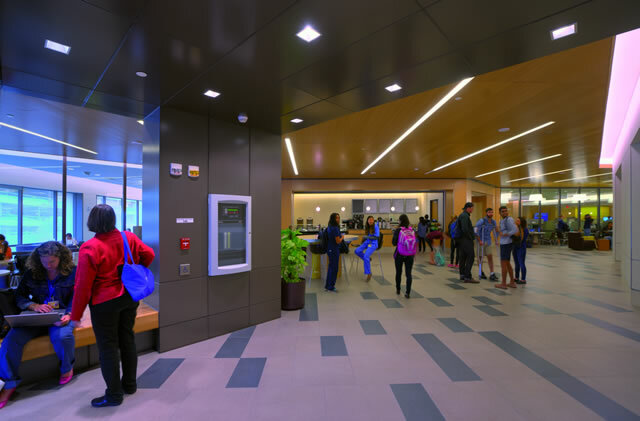 A comprehensive project formation and benchmarking effort helped to determine the most effective design for the improvements to the 21st century library space. The resulting 137,000 SF addition and renovation transformed the building into a light-filled, flexible facility that promotes collaboration and hands-on learning. 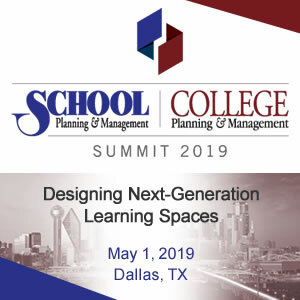 Create a facility that fosters interdisciplinary collaboration within the Health Sciences and supports an evolving pedagogy. 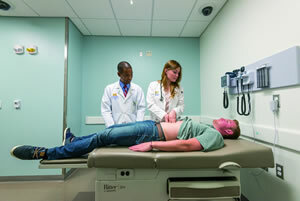 Create a focal point for Health Sciences Education on campus, and build an inspiring home for Medical School students. 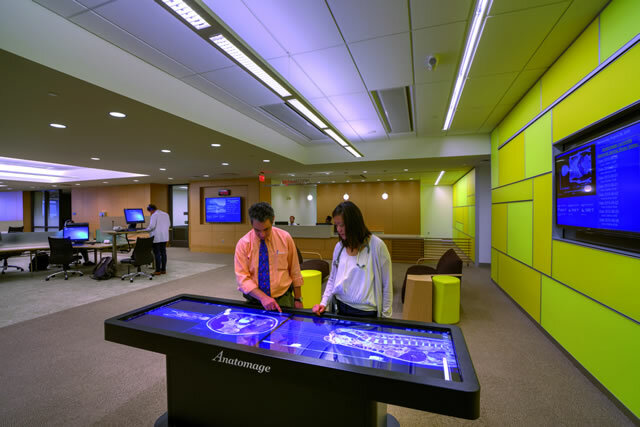 Transform the Health Sciences Library into a forward-looking facility that fully embraces the technology-based learning and research of today’s students, staff and public, and anticipates the needs of tomorrow. Transform the somewhat confusing building into one that can be easily understood and navigated. The new design rejuvenated the building by replacing windowless brick walls with nearly 18,000 SF of low-e glass. The transformed exterior of the building was accomplished by removal of the façade and replacement with a curtain wall system and high performing glass and panels. The “new exterior” respected the material and color palate of the medical complex, while creating transparency where there had previously been only solid walls. The interior space was planned to take advantage of this new transparency, bringing abundant light into the building. The double-height, naturally-lit lounges create an open, transparent environment. 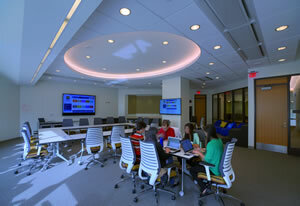 The new library contains simulation suites, classrooms, collaboration labs and study areas. Students and faculty can choose from a wide variety of flexible study and meeting spaces. 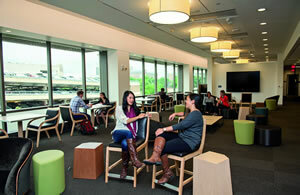 A new café and lounge welcome students and encourage spontaneous inter-disciplinary collaboration. Students practice their skills in the facility’s 30 realistic patient care rooms and by using the Anatomage Table, a life-sized interactive visualization system for anatomy education. Careful planning of the Clinical Skills area yielded a suite that encompasses an entire floor, increasing the number of simulation rooms for the program, creating scalable teaching spaces previously lacking, as well as support space for a robust simulation program that serves all of the health sciences. The new transparent exterior wall brings daylight into this suite as well, including views to elicit a new appreciation of the long-standing and closely sited Victor Vaughan building. The library footprint was drastically reduced from three floors to less than one floor in the renovation, as stacks were moved off-site. Space previously used for book stacks became new academic space in the form of Small Group Rooms, a variety of Study and Meeting Rooms, a Quiet Study Lounge, Testing and Computer Lab spaces, and two unique Collaboration Labs. 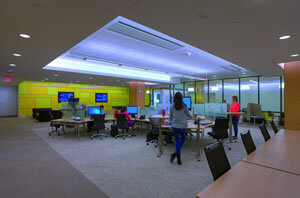 In addition, the Medical Student Lounge and administration offices were built in space previously occupied by books. The Collaboration Labs, as well as Study Rooms and other spaces were designed to invite students to explore all possible ways to work together with their peers as well as with other disciplines. Walls, windows and furniture within these Labs and Study Rooms are to be used as writing surfaces. Technology is varied and accessible to all. Furniture is movable and flexible. 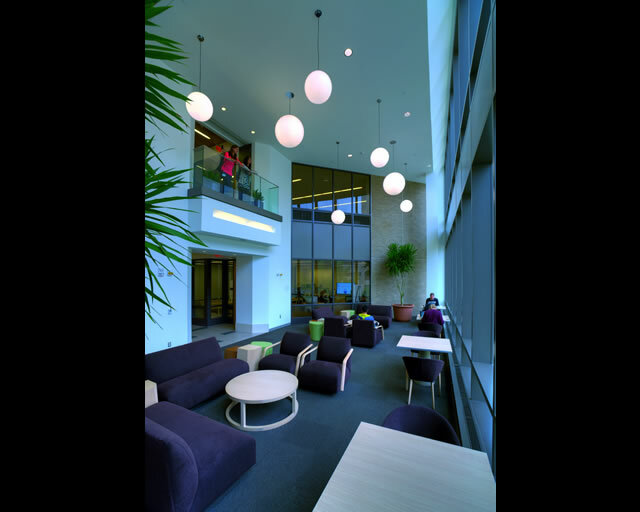 The Library itself evolved into a high-tech, beautiful, transparent and welcoming space that is located on the street level and benefits from an adjacent large circulation and seating area as well as a new café. 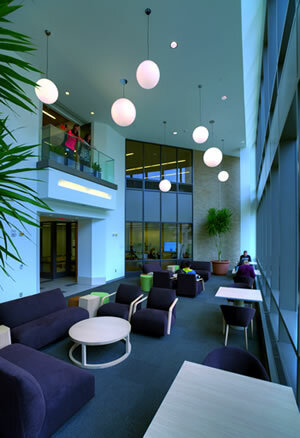 Varying levels of “quiet” space are provided inside the Library for users. The prominent information desk allows easy access to services. Circulation and orientation had been an issue in the old building with limited views to the outside. Now, plentiful visual cues help people make their way through the building. The existing post-tensioned structure was not conducive to creating new openings in the existing floor slabs, so the design team created a “Main Street” concept that serves as the primary circulation organizational device on the four renovated floors. On the street level, “Main Street” is a generous and active space next to the library and cafe, and physically connects the circulation elements of the building (stairs and elevators). A maize-colored glass wall extends from Main Street into the library and welcomes people into the space. On the other end of Main Street, an old exterior porch area was captured and enclosed in glass to create light filled, high ceiling seating areas that overlook a lush exterior courtyard. The other three renovated floors have similar “Main Street” circulation spaces. Porcelain tile floor and wood ceiling finishes are unique to all of the Main Streets and provide immediate orientation to building users. On the street side of Main Street and next to the main entrance, a new, gracious stair was constructed outside the footprint of the original building which vertically connects the four renovated floors. The new stair incorporates another maize-colored glass wall that extends the full height of the stair and creates a golden “glow” at night. The stair enclosure is a prominent vertical feature at the front of the facility, marking the entrance, evoking school pride, and providing an anchor to the building. Punched windows are now a transparent glass curtain wall at the renovated entry, and along Catherine Street, the building’s broad rectangular face – wide swaths of glass set in frames of tan glass-fiber reinforced concrete (GFRC) panels – turn an “invisible” building into a major focal point for Health Sciences Education on campus. The building’s new light-filled openness supports an important transformation on a larger scale. 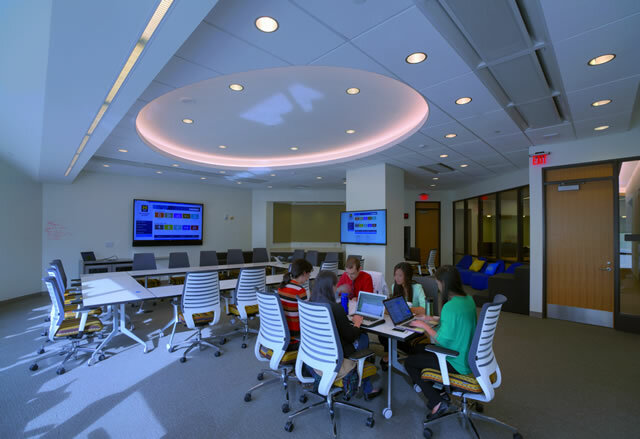 The University’s team had an even broader mission in mind that was realized after completion of the project: Make the renovated Taubman building an integral part of a new collaborative teaching model for one of the top medical schools in the country.